It's the patio furniture/barbecue that you've been looking for ... a beautiful mosaic tile-topped table that invites friends and family to gather around the "campfire" and engage in conversation while you cook. Perfect for backyard entertaining, the Masagril® will be the center of every party and you'll be the host or "hostess with the mostest." Imagine it now ... hear the sizzle of the barbecue, smell those juicy steaks cooking, pass your hands across the beautiful marble tile mosaic tabletop and smile at the pleasant hum of conversation. Your Masagril® will create lasting memories for years to come. The Masagril® is a table, a barbecue and an ice-bucket in one. A gas (propane or natural) or briquet-fired barbecue occupies the center of the 48 inch diameter cast-concrete table, which offers ample room for six. (Charcoal option can also be used as a wood-burning firepit which is perfect for brisk autumn and winter nights! )The table's thick base contains an air inlet, the firepit and an ash bucket. The center can also be used without the barbecue, as an ice bucket or umbrella holder. Made from Glass Fiber Reinforced Concrete, which is lighter than concrete but four times as strong, this patio furniture is durable and built to last. Live in a high wind area? No problem. This lawn furniture will stay put. This beautiful garden furniture is available in four colors: Terracotta, Rosa, Adobe and French Charcoal (see color chart below). Place it on your lawn, deck, patio or in your garden. 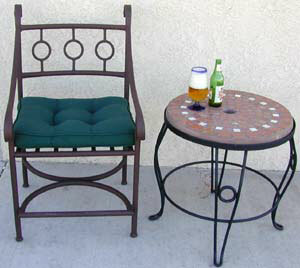 Choose chair (29 inches) or counter height (34 inches) for your outdoor table and chairs, benches or stools. Large picture above features Vista Classic. Price for original style (without mosaic tile) is $1395.00. Mosaic tile styles are featured below. Mosaic tile tables start at $1895.00 for the 48 inch round table and $2195.00 for the 57 inch round table. Delivery surcharge for this patio furniture ranges from $300.00 to $500.00. (Table weight is approximately 700 pounds). Charge includes curbside delivery. Table is shipped in pieces, which can be moved by two strong adults. Curved Mosaic tile-topped benches made of GFRC (see large photo above) match the tabletop and provide ample seating for two adults. Also available without the mosaic tile. GFRC stools are also available. Everything about the design of the Masagril combines form and function. Your table comes with a centerpiece (which allows you to use the Masagril as a table only) when using the grill or ice bucket, the centerpiece of your table can be removed to function as a side table (see photo above). You'll be the envy of the neighborhood with this unique piece of outdoor furniture. Best of all, you enjoy all the moments spent 'round the fire. With the delicious smells and sounds of grilling meat, your friends and family will naturally gather around and create lasting memories as you cook. Call us today and we'll send you a brochure immediately and answer any questions. Since this item has many options, it is orderable only through our toll free number: 1 (877) 279-7583. This item is a specialty item. Expect 6-8 week window from date of order to receipt of item.